I just love your little crow dolls of course. My kitchen witch and her crow are sitting on the mantel at our new old house. Love your crows, big and small! It used to be featured on a children's TV programme. I bet many of our UK bloggers remember it! they are so cute, I just love the pic of those two reading! They are so unique and so precious! I love them! What a beautiful book! 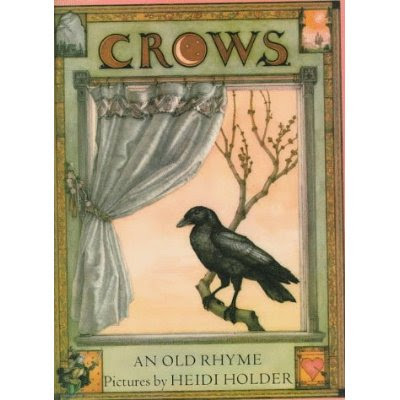 I have never seen that one, but we do have a children's book called Carmen the Crow illustrated by Heidi Holder. The illustrations are exquisite! I love the photo of the crows looking at the book. He he he. What fun! these are terrific...so adorable. We have a lot of crows around here and I absolutely love yours!!! as for the fabric swap - maybe we wait until winter-time? i don't mind waiting - I bought some fabric specially but I can always get more.